AXIS F34 Main Unit offers a cost-efficient, highly discreet solution for the surveillance of four closely situated areas. The main unit, which should be placed in an indoor location, can connect to four different AXIS F Sensor Units. The sensor units can be mounted in tight places indoors or outdoors up to 8, 12 or 15 m (26, 39 or 49 ft.) away, depending on the sensor unit and if a cable accessory is supported. AXIS F34 is ideal for use in small stores and offices, as well as around ATMs (automated teller machines). It is optimized for customers looking for a simple, flexible and cost-efficient multi-view surveillance solution. AXIS F34 enables simultaneous streaming of views from four different areas through one Ethernet port. The installation cost - with the main unit, four sensor units and other system components - can be lower than the cost of a system that involves four comparable standard network cameras. Costs for a network switch, for instance, may be lower as the number of ports required can be reduced. License fees for the video management software (VMS) can also be lowered if the VMS sees AXIS F34 as requiring one license instead of four. The overall installation and placement of the units may also be easier and more flexible than with conventional camera solutions. AXIS F34 has two built-in full-sized SD card slots for local storage of recordings. 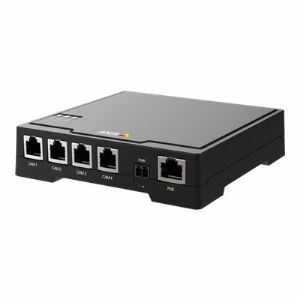 The main unit supports Power over Ethernet and 8-28 V DC.